With apologies to Tolstoy, every coercive dictatorship is coercive in its own way. This is the central claim of Sheena Greitens important and timely study of authoritarianism, Dictators and Their Secret Police. Greitens argues that dictators face not only the usual array of external threats that all leaders confront; they also face a daunting array of violent internal threats that can range from elite-led coups all the way to general popular uprisings. Different dictators perceive and prioritize these threats differently, and adjust the design of their institutions of state coercion accordingly. These different configurations of state coercion yield their own differential implications for the political choices confronting citizens and their likely behavior in response. Ultimately, Greitens argues that she can trace political behavior all the way from a leader’s perceptions of threat to the response of citizens, thus providing a theory of institutional design and evolution. She demonstrates this claim with detailed studies of the evolution of dictatorships in the Philippines, Taiwan, and South Korea, and more summary considerations of Iraq, East Germany, and Chile. 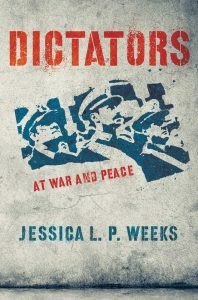 The International Security Studies Forum (ISSF) of H-Diplo is very pleased to provide a roundtable discussion of Dr. Jessica Weeks’s book, Dictators at War and Peace. The book offers an important answer to the centuries-old international relations question as to how the politics within states affect the politics between states? Since at least the Enlightenment, most observers have tackled this question by focusing on the differences between democracies and dictatorships, Immanuel Kant and others famously arguing that democracies are more peaceful. Realists have been skeptical of this claim, contending that all types of political systems conduct foreign policy similarly. Especially since the end of the Cold War, international-relations scholars have been consumed with the scientific exploration of the democratic peace proposition.